AGS & Handrails’ Eco Glass Handrail is our most popular and economical glass handrail system. The Eco Glass Handrail system was engineered in 2001 to offer the public an optimum view of a building’s interior surroundings. The stainless steel materials are Eco-friendly and the installation of the glass panels is 40% more cost efficient making it a economical glass handrail system. The Eco Glass Handrail system will exceed a 200 Lb. load with either a continuous metal cap rail channel or a 1 1/2″ O.D. ADA / grab handrail at stairs and ramps. We have the Product Data for Credit MR 4.1 and MR 4.2 for LEED submittals. E-mail or call us today for our specification Section 057300. 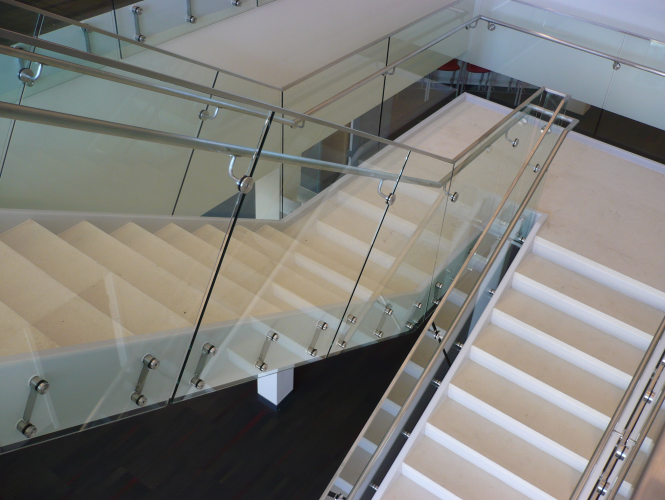 Learn why this is the most economical glass handrail system on the market.